CHARGING A VERTICAL RETORT. An electrically driven skip, loaded from overhead hoppers, runs on a track which brings it over the manholes at the top of the retort. Workmen lift the lids, the skip moves into position and the load of coal is discharged. Bright flames light up the retort house as the skip moves off for another load. Workmen close the manholes, and the charge is then baked at a temperature of over 2,000° F, giving off gas in the process. GAS making is one of the most important industries in the world. In Great Britain alone over £200,000,000 of capital are invested in the gas industry, which uses nearly 20,000,000 tons of British coal every year. But the pioneers of gas making did more than lay the foundations of a great industry, supplying light and heat to millions of people and a cheap and handy fuel in the form of coke. They unlocked the treasure house of coal. For millions of years coal had hidden its secrets far below the surface of the earth. Thousands of years after the coming of man, coal yielded its store of heat to any who would dig for it. Less than three hundred years ago man discovered that if he heated coal he obtained a smoke or gas that would burn. Most people remember the coal gas experiment of their school days. A clay pipe is filled with small pieces of crushed coal, and the top of the bowl is then covered with a piece of clay. The bowl of the pipe is heated and a yellow-brown smoke issues from the stem. On the application of a lighted match the smoke burns with a brilliant flame - it is coal gas. It was by such simple experiments that the pioneers of gas making demonstrated the possibilities of their discoveries. In 1691 Dr. John Clayton prepared gas from coal. Stephen Hales carried out experiments with coal gas in 1726, and Professor Jean Pierre Minckelers, of Louvain, Belgium, lighted his lecture room with coal gas in 1785. Lord Dundonald, a great British scientist, lighted the hall of Culross Abbey, Fifeshire, with gas in 1787, and in 1792 the famous William Murlock began a series of experiments that culminated in the illumination of Boulton and Watt's workshops at Birmingham in 1802, and of the premises of Phillips and Lee at Manchester. It was Winsor who had the vision to see that gas could be distributed by mains through the streets to large numbers of houses in the same way as water. By 1807 Pall Mall, in London, was lighted with coal gas, and in 1812 a charter was granted to the Chartered Gas Light and Coke Company - forerunner of the undertaking that is now the largest gas concern in the world. Coal yields such widely differing products as drugs and high explosive, paint and scent, dyes and disinfectants. A gasworks may be built at the pithead, with the coal just beneath its foundations; by a railway, along which the mineral can be hauled; or close to a waterway. Water provides the cheapest method of carrying coal, whether by barge on canal or river, or by coastal collier on the sea. The first duty of the gasworks engineer is to ensure that there shall be adequate reserves of coal, for gas making must go on ceaselessly, day and night, year after year. The reserve stocks of coal at a large gasworks may be as much as 250,000 tons. The first process is the crushing of the coal so that it may flow readily from one container to another and be in the best condition to fill the retorts or ovens. Coal may be fed to the crushers by great steel grabs suspended from overhead cranes running on gantries that span the coal heaps; it may be sent also to the crushers in railway wagons. A wagon load of coal is run on to a rotary tippler, which turns the truck upside down and empties out the contents into a receiving hopper. From this the coal is fed into the crushing machine, a huge revolving steel drum with perforated sides and breaking-bars arranged internally. The coal may be broken so that individual pieces are about the size of a walnut, or further crushing may be done by great power-operated stamps or hammers. The next destination of the crushed coal is the carbonizing plant, with its retorts or coke ovens. In the retort house, a huge and surprisingly clean building with a louvred roof, a series of steel ladders leads to what appears to be a street full of manholes, arranged in pairs and provided with lids. Adjacent to each pair of manholes is a gas discharge pipe curving up from the "pavement" of the street to enter a horizontal pipe that runs the whole length of the building. On the curving top of each vertical pipe is another lid similar to those on the manholes. Each pair of manholes, with its adjacent pipe, gives access to a vertical oven about 10 feet long, 1 foot wide and 20 feet deep. The oven is built of a fire-resisting material called silica. At the bottom of each oven are a power-operated flap or door and another gas discharge pipe, the end of which dips into the liquid in a sealed hydraulic main. This main receives gas from the lower part of the ovens, and its construction ensures that air cannot enter through the discharge pipes. The great rectangular caverns of silica are heated by surrounding flues carrying the hot gas from a special type of furnace that burns coke. The oven flues are gas-heated by what is known as a "producer". This is a deep furnace with a "step" grate, resembling a big steel ladder, at the bottom. Coke is fed into the top of the furnace through a hopper, and from the side issues a large flue that leads to the main flues of the ovens. Air, sometimes preheated by flue gases, is admitted to the furnace above the layer of coke. Waste flue gases are used to generate steam in special boilers for auxiliary purposes. A wonderful sight is presented by the brightly glowing walls of the oven when seen from below. The charging of a vertical retort is interesting and spectacular. Spanning the long row of lidded manholes is a railway track on which runs a skip driven by electricity, and carrying three or more tons of coal according to the size of the plant. The skip is loaded from overhead hoppers which receive their supplies by moving conveyers from the crushing plant. With the glowing pit beneath them, the attendant workmen lift the lids of the retort, including that on the upper gas discharge pipe. The lower door of the oven is closed. Then the electric skip, with its load of crushed coal, moves slowly into position over the manholes. A lever is touched, the coal rushes swiftly down the steel sides of the skip and disappears into the open mouths of the brightly glowing retort. 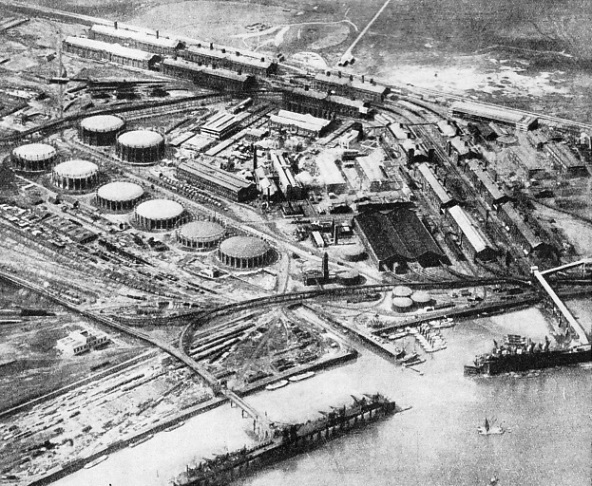 BECKTON GASWORKS, belonging to the largest gas company in the world, occupies about 280 acres of land on the north bank of the River Thames to the east of the Royal Albert Dock. 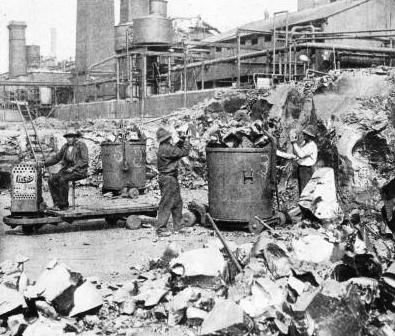 The gasworks supplies about 40 per cent of the requirements of the area served by the Gas Light and Coke Company. Two piers on the 2,500-feet river frontage facilitate the reception of raw materials and the dispatch of by-products. The plant is capable of producing 120 million cubic feet of gas a day. Now follows a repetition of the clay pipe experiment, on a somewhat larger scale. From the open manholes there issues a yellow-brown smoke - coal gas in the raw. Suddenly the smoky gas bursts into bright flame and lights up the gloomy interior of the retort house with a thousand dancing fires. The heavy iron lids close and the electric skip moves off for another load. At a temperature of over 2,000º Fahr. the charge is baked for several hours, giving off gas in the process. A fine spectacle is also provided by the discharge of an oven. Beneath the retort bench is an open-sided tunnel equipped with a railway track. When a charge is due for withdrawal a bell clangs at the far end of the retort house and a large steel skip is slowly pushed into position beneath the oven by an electric locomotive. Then the lower door of the oven is opened and a cascade of red-hot coke falls into the open mouth of the skip and casts a lurid glow along the darkened tunnel. Once clear of the oven. the glowing coke shoots out great tongues of coloured flame and the skip, with warning bell clearing a passage, is hurried into the open air to a concrete water tower. The quenching of the coke is done with a measured quantity of water, because the water content has a definite relation to the quality of the coke. In some gasworks, rectangular-section ovens were formerly arranged in an inclined position, and the red-hot coke was discharged into a V-section coke dock, whence it was carried away, and at the same time quenched, by a moving conveyer flooded with water. 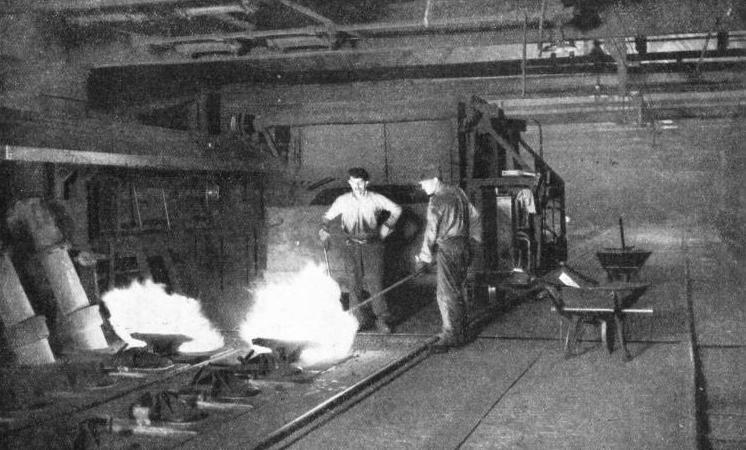 In the United States of America, in many countries on the continent of Europe, and recently in Great Britain, the rectangular-section coke oven is built in a horizontal position. Ovens of this type are generally situated in the open air and, as the great wall of red-hot coke is pushed on to a shelving platform by hydraulic power, men play on the artificial volcano with fire hoses. At night the glow lights up the sky and the brightly coloured flames and billowing clouds of steam provide a strange, fantastic scene far removed from any association with so ordinary a commodity as coke. The subject of coke is important because, out of 20,000,000 tons of British coal carbonized every year, there are produced about 13,000,000 tons of coke. Some of the coke produced at a gasworks is passed along sloping screens, which are operated by machinery. Here the coke is sorted into various sizes for sale to steelworks and other industrial plant, to factories, and to the private consumer for heating the kitchen boiler. The remainder of the coke is used in the gas-works for making "water gas". Retorts of the horizontal type were at first made of cast iron, but so much trouble was experienced with cracked retorts that fireclay was substituted for iron. This gave place in later years to the silica ovens now in general use. Horizontal retorts are heated in a manner similar to the vertical ovens, but there the resemblance ends. They are generally arranged in the "bench'' in groups of six, eight or ten, and are double-ended, with a door and a vertical gas discharge pipe at either end. Horizontal retorts are loaded and discharged by machinery of suitable design. One type of machine in common use with horizontal retorts is electrically operated. Crushed coal falls on to a fast-running rubber belt and is shot into the retort by centrifugal force. The red-hot coke is removed by an electric ram and falls on to a conveyer flooded with water. The gas, as it leaves the retort house, is a yellow-brown smoke. If used in this condition the gas would give a poor light, not much heat or power, and it would quickly clog and corrode the supply pipes. Further, such supply would be illegal. The next process, therefore, is to cool the gas from its retort house temperature of 150° to 170° Fahr. in a water or air-cooled condenser. This condenser may be in the form of a tower containing a number of water tubes round which the gas flows. Other types comprise a long zigzag of pipes cooled by exposure to the air. AT GREENWICH GASWORKS. Pitch, which is shown being loaded into a skip for removal, is produced by the repeated distillation of coal tar. More than 2,000 products are now made from coal tar, which is distilled in four stages, yielding three grades of oil, as well as pitch. Crude tar serves also as a preservative coating, and the residue, after distillation, is used for road surfaces. The effect of cooling the gas in this way is to turn into liquids all substances in it that would otherwise clog the supply pipes. Such substances are tar, light oils and water containing ammonia salts. The combined liquid, with similar liquid direct from the gas discharge mains in the retort house runs down to an underground tank or well, where the tar separates out by settling to the bottom. This is the first stage in the purification of coal gas, which must, in accordance with the law, be supplied to the public in a pure state. Condensation is also the first stage in the recovery of the valuable by-products of gas making. Having left the condensers the gas is helped on its way by large rotary pumps called exhausters. These pumps are generally driven by steam engines, magnificent machines housed in a spotless tiled engine room. Normally the engines of the exhausters must never stop, day or night. It is quite common for one of these engines to run continuously for five years before its duties are handed over to a stand-by machine while replacements are made or repairs are carried out. The gas is now due for washing, and although machines and methods differ in various works, the process is basically the same in all instances. The first of the washing devices is the scrubber - rather a misnomer for this apparatus. It comprises a tower about 50 feet high, containing some four compartments divided by perforated trays that hold layers of coke. Water is sprayed down inside the tower and, as the gas rises through the coke-laden trays, it is washed free from another of its contents - ammonia. Water will absorb about 900 times its own volume of ammonia, and the liquor from the scrubber drains off to the tar well. The next machine really is a scrubber, but it is called a rotary washer, and consists of a number of bass brooms that move slowly round inside a steel drum containing water. The brooms expose the gas continuously to large wetted surfaces, and so dispose of the last of the ammonia. The ammonia is drained down to the tar well. The gas is next heated in a large tank containing coiled steam pipes. to prepare it for the purification process, carried out at atmospheric temperature, the heaters maintaining the temperature in cold weather. The primary object of purification is to remove sulphuretted hydrogen from the gas. The purifiers consist of a series of large cast-iron boxes fitted with trays containing a purifying material (hydrated ferric oxide) which absorbs the sulphuretted hydrogen. The ferric oxide is converted into ferric sulphide. This substance is exposed to the air, and turns back into iron oxide mixed with a certain amount of sulphur. This happens over and over again, until the mixture (resembling brown sand) contains about 55 per cent of sulphur, and it is then turned over to a chemical works for the manufacture of sulphuric acid. Nothing is wasted. Further chemical treatment of the gas yields Prussian blue and the deadly poison gas, known as hydrocyanic acid, which is used for exterminating rats, for destroying wasps' nests and for freeing orchards from blight. Finally, the purified coal gas passes through a works meter, which registers the amount of gas made, and thence goes into the gasholder. Gasholders (for which the term "gasometer" is frequently misused) are of two types, wet and dry. The wet type consists of a bottomless drum floating in an open-topped drum or well containing water. The gas is collected above the surface of the water, and the top of the holder rises and falls with the fluctuations of the gas supply within. FROM COAL TO CONSUMER. This diagram illustrates the process involved in the making of gas and its by-products. Coal is shipped, often in colliers owned by the gas companies, and conveyed to the site of the gasworks. The coal is distilled and coke is produced. In Great Britain 13,000,000 tons of coke are produced in this way every year. The gas is purified and the various by-products are extracted in the process. Finally, the gas is stored in large gasholders from which it is drawn at will by millions of consumers. The other type of gasholder consists of a huge steel tank in which an enormous piston is forced upwards by the pressure of gas beneath it. The piston is rendered airtight by a "seal", a stream of tar that is pumped continuously round its edge, to prevent the leakage of gas and the entry of air. To augment the supply to the consumer, the gas companies add to the coal gas a quantity of "carburetted water gas", which has characteristics similar to those of the product distilled from coal. A water-gas plant may be started up far more quickly than a retort bench, and it provides a ready means of increasing the supply to cope with "peak loads" due to a sudden cold snap or fog. Water gas making is an important auxiliary to the production of a town's gas, and in some works as much as 25 per cent of the supply comes from the carburetted water-gas plant. The methods of purifying water gas are similar to those employed for coal gas, except that water gas requires no ammonia purification. In other ways the two methods of gas manufacture are dissimilar and different raw materials are involved. For the making of water gas, a battery of generators is used. These are large, vertical drums lined with firebrick and filled with coke through an opening in the top. The coke is ignited and brought to a glowing red heat by an air blast. Air is supplied by great rotary fans driven by electricity or by fast-running steam engines. These engines, as arc those driving the coal-gas exhausters, are accommodated in a spotlessly clean engine room. The roar of the air blast can be compared only with that of a great winter gale concentrated in one huge steel pipe. When the air blast has done its work and the glowing coke has attained the required temperature, the air supply is cut off and another cyclone is let loose into the generator. This time the blast is of high-pressure steam, which is split up by the action of the red-hot coke and turned into a mixture of hydrogen and carbon monoxide. The coke burns away, leaving clinker, which is removed from time to time as fresh coke is added to the generator. The gas mixture is then passed to the carburettor, which bears no resemblance to the carburettor of a motor car. The carburettor of a water-gas plant is a large tower lined with firebrick and packed with spaced brickwork. It is heated by the hot blast gas from the generator. The interior of the carburettor is maintained at a temperature of about 1,300° Fahr, and at the top is a special type of spraying nozzle. Heavy oil is sprayed into the hot carburettor, where it is immediately converted into oil gas. This oil gas enriches the water gas from the generator and gives to it the required heating value. 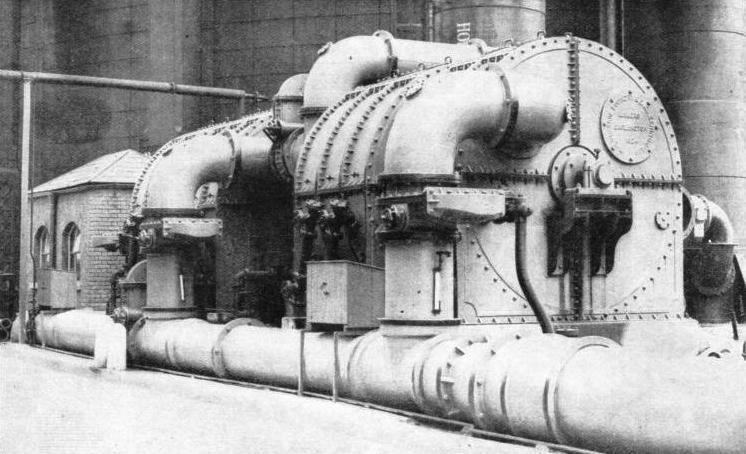 The carburetted water gas is next passed through another brick-filled tower, called a superheater, which is heated in a manner similar to the carburettor. The object of the superheater is to "fix" the oil vapour, so that it shall remain permanently as a gas, without condensing into a liquid again. The carburetted water gas is then cooled, washed, purified and finally passed through a works meter to the gasholder. A NAPHTHALENE EXTRACTION WASHER through which gas is passed during processes of manufacture. Naphthalene is extracted from the gas as a by-product and plays an important part in the dyeing industry, in addition to its other uses. In further stages the gas is purified on its way to the works meter, where it is measured before being discharged into the gasholders. A modern gasworks supplying a large residential area containing 100,000 customers (houses, shops and factories) will have some 500 miles of gas mains through which will pass about thirteen million cubic feet of gas every day. The distribution points may be ten, twelve or fifteen miles away from the gasworks, necessitating the provision of local gasholders at suitable distant sites. Such gasholders are supplied by powerful rotary pumps or "boosters", driven by steam turbines. These "boosters" force the gas along high-pressure mains. Similar high-pressure gas mains, made of steel with welded joints, are used for the supply of gas to industrial districts. 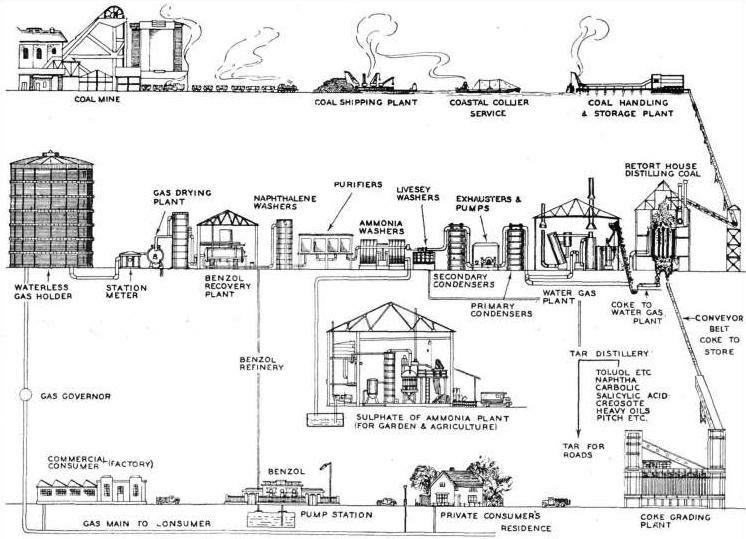 The amount of gas used in modern industry is enormous. It is required for factory heating, for the operation of gas engines of all sizes and for the heating of containers and boilers in thousands of processes. Gas makes an ideal fuel for all types of furnaces, but one of its most spectacular industrial uses is in conjunction with oxygen for welding and the cutting of metal. With an oxy-gas blowpipe, supplied through flexible pipes with coal gas and oxygen from a storage cylinder, a great bar of steel may be cut into slices without difficulty. With all its many uses in industry and the home, however, there is one other important aspect of gas supply. This is the recovery of by-products during the process of manufacture, a feature that is of the utmost national importance. The tar produced in the gasworks of Great Britain amounts to more than 200,000,000 gallons every year. At one time tar was regarded as the biggest nuisance in the life of the gas engineer. Its few uses included the bedaubing of fences and barn doors, and it was difficult to dispose of. About a hundred years ago, however, the chemist turned his mind to the problem of tar disposal. The number of things that can be made from coal tar is now well over 2,000, and this number is constantly increasing. AS WE have seen, tar settles at the bottom of the well, leaving the ammonia liquor floating on top. The liquor is drawn from the well and heated with lime. The ammonia gas thus given off is passed through the sulphuric acid produced by the plant, previously described, which removes sulphuretted hydrogen from coal gas. From the solution of ammonia in sulphuric acid is recovered ammonium sulphate in the form of crystals. This sulphate is dried and put into sacks, and is sold to gardeners and farmers as a fertilizer. Ammonium sulphate is one of the most valuable of fertilizers, and British gasworks produce over 66,000 tons of it every year. The tar is drawn off from the bottom of the well and heated by steam to drive off the remaining liquor. The tar is then distilled in four stages, yielding light oil, middle oil, heavy oil and pitch. Crude tar is used as a preservative for steelwork and for other purposes. The residue, after distillation of light oil, is the tar used for road-making. The light oil produced by the initial distillation of tar yields a motor spirit, benzole, used also in the dye industry. The next distillation produces solvent naphtha, used extensively in the rubber industry and for the making of paints and varnishes. Yet another product is light creosote oil, which forms the base of many disinfectants. The heavy creosote oil that remains is the creosote used for preserving wood - fences, posts, telegraph poles and railway sleepers. The substance remaining after repeated distillation is pitch, used with coal dust in making briquettes as fuel for railway locomotives. Coal has been given the title "black diamonds". This description scarcely does it justice, for untold wealth is locked away beneath its hard, bright surface. The gas we obtain when searching for its treasures is unique among the fuels used by mankind. Gas is the only fuel that can be stored in large quantities and drawn upon at will from far and wide. 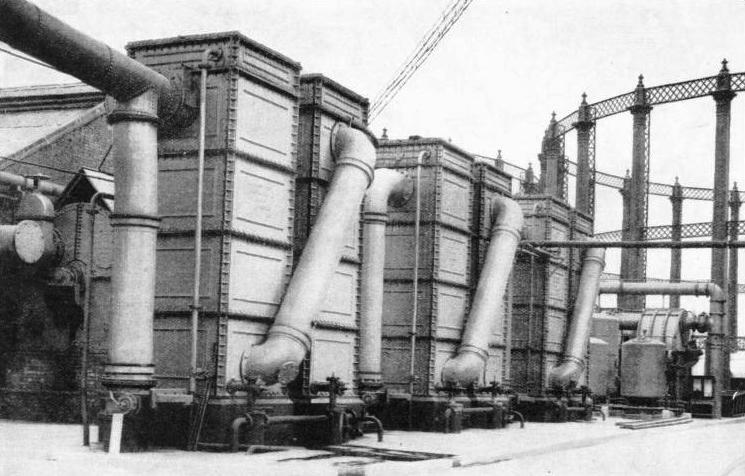 WATER-COOLED GAS CONDENSERS at Bow Common Gasworks, London. Gas, emerging from the retort house at a temperature of about 150-170° Fahr, is cooled in vertical towers containing water tubes. This cooling process liquefies substances in the gas that would otherwise interfere with the gas supply. Such substances include tar, light oils and water containing ammonia salts. You can read more on Handling 2,000,000 Tons of Coal (at Beckton) on this website; you can also read William Webber’s book on Gas and Gas Making (1916); and you can read about the Beckton Gas Works Railway in Railway Wonders of the World (1935).